This Easy Glazed Ham is perfect for holidays and family dinners. This is the recipe you will pull out over and over again when you have a table full of family and friends coming for dinner. I can’t even tell you when this recipe for Easy Glazed Ham came into existence. I have leaned on it for so long on holidays and big family meals. Earlier this week, I sent it to the potluck at my husband’s office. The recipe has been tweaked a little over the years – and sometimes gets tweaked based on what is in my pantry. But mostly, it is the ham everyone wants when they sit down to eat. I will never complain because it is completely stress free. For years, my recipe for this ham has lived in a binder full of handwritten notes and scribbles – and no small number of food stains. But the only person that can read anything in the binder is me because my handwriting is atrocious. As I was thinking about the menu for our next holiday meal (and how terrible my handwriting was), it occurred to me that I really should share this recipe with you guys. The glaze is magical. Far better than the powdered stuff that comes in the cellophane bag attached to the ham at the grocery store. The best time to glaze your ham is in the last hour of cooking time. If you try to do it too early, the sugars can burn and nobody wants that. The upside is that all you really have to do for a fabulous main dish is stick the ham in the oven on time until you are ready to glaze the ham. See… totally stress free. If you cook it in one of those disposable pans, you don’t even have to wash up the mess. This Easy Glazed Ham is very flexible. I love peach preserves but also use apricot if I can’t find them. If I was on a desert island and could only bring one thing to flavor my food, it would be shallots but if you don’t have them, mild onions work just fine. If you don’t have chipotle pepper flakes, red pepper or even cayenne pepper works great too. Feel free to adjust the heat level to your preference. We love the sweet glaze with the a mild smoky heat from chipotle pepper flakes. 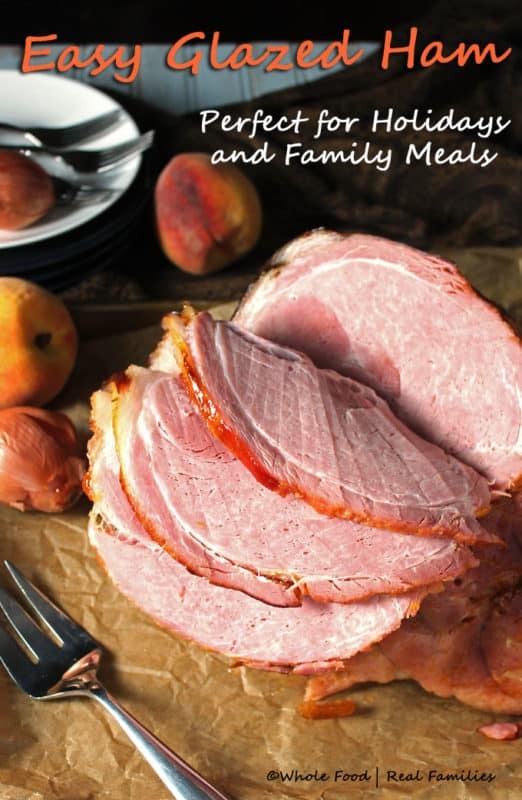 What do you serve with ham as a main dish? 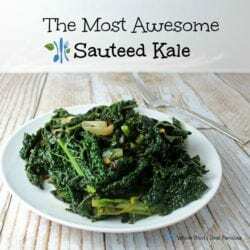 We love this Awesome Sauteed Kale! We were all kale haters before this recipe. Surprise, surprise it is flavored with shallots. I told you they were magical. Oh yeah. 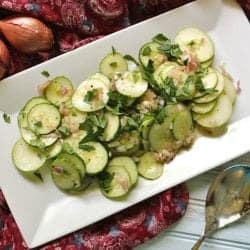 And this Cucumber Shallot Salad. I told you. I have a shallot problem. 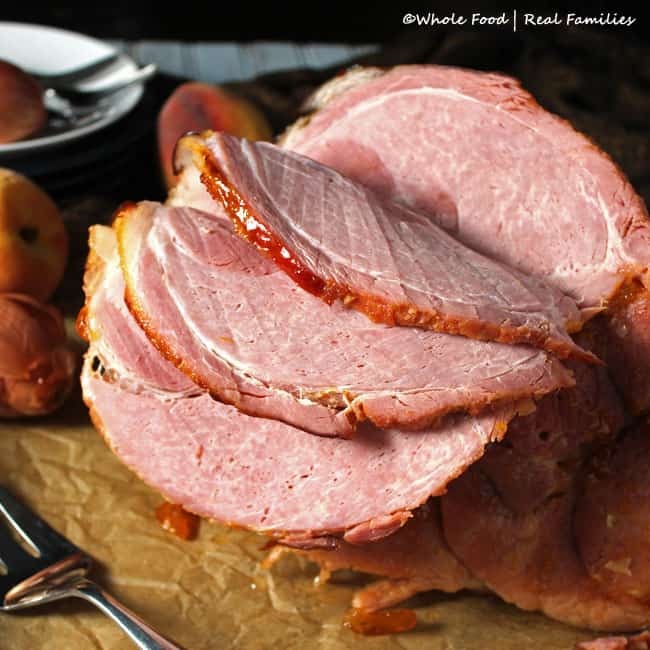 You will want ham to cook approximately 20 minutes per pound, or until it reaches an internal temperature of 145 degrees at the thickest part of the ham without touching the bone. The simplest way to check that is with a good meat thermometer. About an hour before your ham is ready to come out of the oven, make your glaze by melting the butter in a small sauce pan, add shallots and cook until they are soft. Add peach or apricot jam, honey and chipotle flakes. The heat will make the glaze thinner. You don't need it to boil, just heat until you can whisk it all together. Turn off the heat and sit the sauce aside to cool. It will thicken as it cools and that will make it easier to brush on the ham. About 40 minutes before the end of the cooking time, remove the ham from the oven, discard the foil. Brush ham with about half of the glaze and return it to the oven. Repeat this step with the remainder of the glaze about 20 minutes later. Remove the ham from the oven when it reaches the correct internal temperature. Let the ham stand for 15-20 minutes before slicing. Enjoy! Here via FB and I’ve written down your recipe for our Christmas Eve Eve dinner. Can’t wait! Let me know what you think! This is our favorite. I will be making it Christmas day!